Dr Andrew Renaut says people should stop counting calories. WE KNOW it as the most important meal of the day. But an Australian surgeon claims to lose weight, dieters should ditch breakfast - and use the morning to exercise on an empty stomach. Dr Andrew Renaut, a Brisbane based specialist in laparoscopic, colorectal and general surgery, says his research and study in the area of obesity and the gut means he's established a program will result in weight loss for troubled dieters. Forget counting calories; according to Dr Andrew Renaut it's a waste of time. The premise around Dr Renaut's eating plan is incorporating fasting in to your everyday lifestyle. For the 61-year-old, his day revolves around a single six hour "eating window" between 1pm and 7pm, where he will consume around 2500 calories. The remaining 18 hours of the day is for fasting - where only water, black coffee and green tea is allowed. "The underlying problem with obesity is insulin," he said. "By eating regularly throughout the day, the body isn't given an opportunity to bring insulin levels back down to zero. Instead, the levels are always elated. Carbohydrates, which turn in to sugar, keep that level up. "This leads to insulin intolerance which means to receive that spike in energy levels, the body needs to have more glucose." Dr Renaut says forget breakfast, and use the time in the morning to work out. Insulin is produced by the pancreas, and is a main regulator for sugar levels in the blood. When we eat, glucose levels rise, and insulin is released into the bloodstream. Often, insulin is dubbed as the 'key' to energy levels, because it opens up cells so they can take in the sugar and use it as an energy source. Dr Renaut said we need to allow our body to stop insulin production for a large potion of the day to allow our cells to use up the fatty acids instead. "All the diets concentrate on the amount of food we eat, and that is the least important because that's not what's increasing insulin," he said. "Once upon a time, man would go days without food. They wouldn't wake up and say 'what's for breakfast'. "Now, some people have around six meals a day which means the insulin levels never drop to zero. "When it comes to food, there are three main factors: How much do we eat, what type of food we eat, and the amount that we eat. Of those three, the most important is when we eat it." Dr Renaut said to restrict eating to a six hour window. 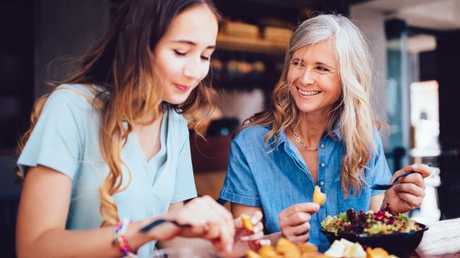 A recent study by the University of Surrey, which was published in the British Journal of Nutrition this month, showed that not only can intermittent energy restriction assist with weight loss, it will also clear fat from the blood quicker after eating meals than daily calorie restriction diets. 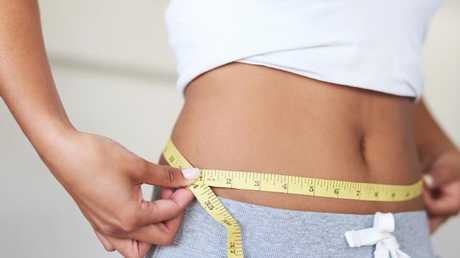 The study, which only used a very small sample size of participants, the group were assigned to either the 5:2 diet or a daily calorie restriction diet and were required to lose five per cent of their weight. Those on the 5:2 diet ate normally for five days and for their two fasting days consumed just 600 calories. 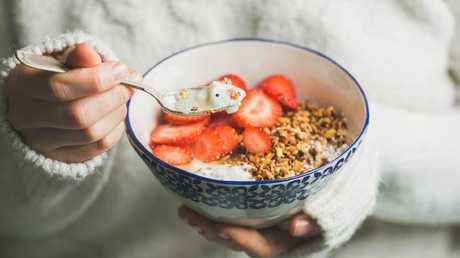 Those on the daily diet were advised to eat 600 calories less per day than their estimated requirements for weight maintenance (in the study women ate approx. 1400 calories and men ate approx. 1900 calories each day). 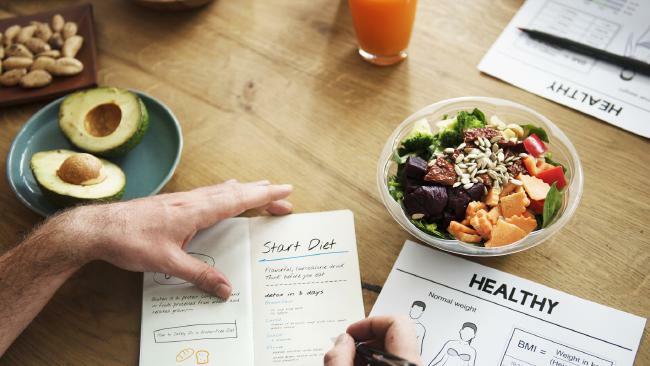 The research showed that those on the 5:2 diet achieved 5 per cent weight-loss in 59 days compared to those on the daily calorie restriction diet who achieved their goal in 73 days. According to the Australian Food Standards Code, a balanced diet for an average adult is made up of 8,700 kilojoules of energy, 50 grams of protein, 70g of fat, 24g of saturated fatty acids, 310g of carbohydrates, 90g of sugars, 2.3g of sodium (salt) and 30g of fibre. Dr Andrew Renaut says the key to losing weight is by only eating six hours daily. But as part of the plan, which Dr Renaut said is not a 'diet' but rather a 'method of eating', means breakfast is off the menu. "People need to stop eating for a significant amount of the day and stop eating refined carbs," he said. "It doesn't matter when you do the feeding window, but later in the day tends to be easier for people. You still need to consume the same amount of calories you normally would - so 2000 for women and 2500 for men - and you're not restricting anything except for carbohydrates." For Dr Renaut, a day on a plate usually consists of fresh fish, meat and poultry, cheese, vegetables and dairy. He doesn't include any for of carbohydrate, including bread and pasta. "I think this eating plan is something everyone could do," he said. "By not restricting, you're not running the risk of running in to deficiency because there's nothing out of the diet except for carbohydrates."